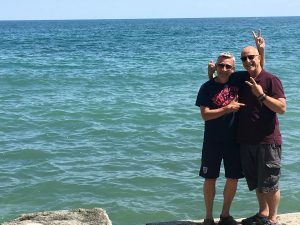 Summer Student Tour 2017 | Another great journey! It was another fabulous journey this year on our annual Summer Student Tour 2017! 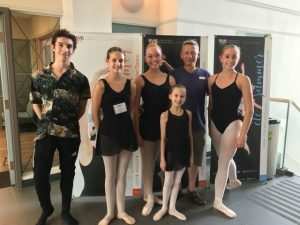 Every year, we visit our students who have successfully auditioned to attend ballet company schools across North America. These summer intensives are the second-level audition for the full-time in-residence professional training programs offered by these international schools. Of the few hundred students accepted to these summer programs, only a handful are subsequently invited to join the full-time school-year programs in September. First stop – Calgary. 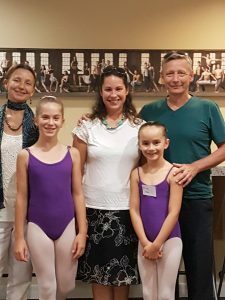 We visited with Andrew, Allison, Abigail, and Katherine, who had successfully auditioned in the fall of 2016 to attend the School of Alberta Ballet’s summer intensive. Mrs. & Mr. Carney with Katherine, Allison, and FVAD’s costume designer Casey. 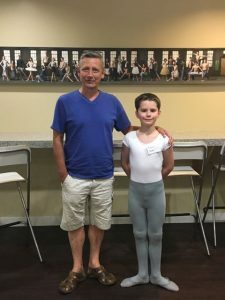 Andrew was invited on full scholarship to their summer intensive 2018, and their Professional Division for 2018-19. We also had a chance to see Kaylie, our Pre-Professional Academy alumnae who is entering her third year in 2017-18 with their Professional Division. 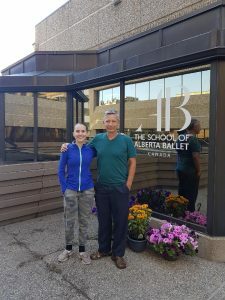 Mr. Carney found time to catch up with School of Alberta Ballet’s senior ballet teacher Mr. Murray Kilgour, who was a dancer of the Royal Ballet in England while Mr. Carney was training at the Royal Ballet School in the late 1970’s. As the company and school shared studios, Mr. Carney and his classmates were regularly inspired by watching these amazing company dancers. Mrs. Nancy Kilgour taught Mr. Carney while at the Royal Ballet School, and would later teach company class for Mr. Carney and his dance colleagues in the Rambert Dance Company. It’s such a small ballet world! Next stop – Winnipeg. 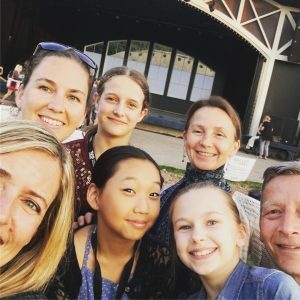 We throughly enjoyed our time once again at the Royal Winnipeg Ballet School, watching classes, and talking with the wonderful RWBS staff, teachers and directors. 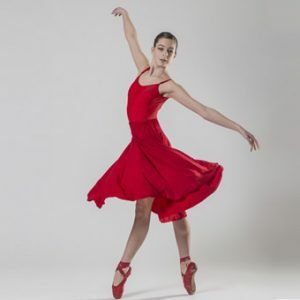 Our students Anna, Grace, Marin, Brooke and Lindsay had all been successful in their auditions for the RWBS summer intensives, and were in residence at RWBS for four weeks in various levels of class. Marin was completing her first full-time year in the RWBS Professional Program having been accepted into the program the previous summer. 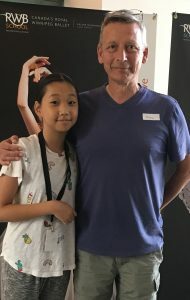 It is such an inspirational environment, where the company and school share studios, allowing students to be inspired professional dancers on a regular basis, as was Mr. Carney at the Royal Ballet School. Following her successful second-level audition at the summer intensive, Anna was invited to their full-time Professional Program for 2017-18. She hopes to have another opportunity to attend when she is a bit older, as she is not quite ready to move away from home just yet. Marin was invited for her second year of full-time training, receiving a scholarship award for Artistic Excellence. Brooke also received her invitation following the summer audition, and will be joining Marin at RWBS in September. Mrs. and Mr. Carney with FVAD moms Sylvia and Jennifer, and Grace, Lindsay and Anna. We also had the distinct pleasure of seeing Josh, finishing in his senior year at RWBS, who had trained with us in Mission several years before. 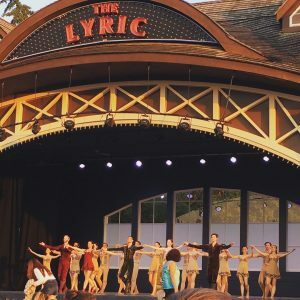 Josh was absolutely wonderful in his performance that evening in RWB’s Ballet in Park, a free event attended by thousands of people over three days every summer, and quite of few from Fraser Valley Academy of Dance! 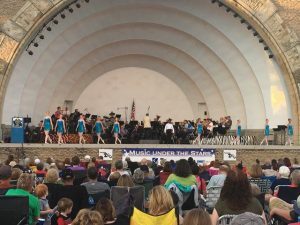 We are so fortunate each year to visit RWB at the same time as Ballet in Park is presented! Next stop – Toronto. 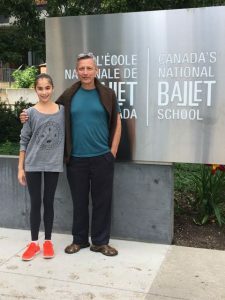 We had another exciting visit to Canada’s National Ballet School where we learned that Pre-Professional Academy student Isabella had been moved out of the regular stream and into a special class of only 6 students. She was one of very few students invited to join the NBS full-time training program in September. A wonderful reflection of both her talent and training! Continuing our small-world theme, one of Isabella’s teachers at NBS had been a student and professional dancer in Turkey many years before. It turned out that she had seen a performance on stage in Istanbul in which Mr. Carney had danced when he was on tour with English National Ballet (then London Festival Ballet) and the iconic Mr. Rudolph Nureyev! Next stop – Oakville. As with most trips, we always try to meet up with former dance colleagues of Mr. Carney’s, and this trip was no exception! 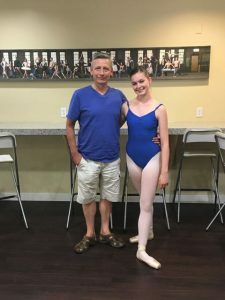 We stopped in at Oakville for a visit with Dewi Fairclough who danced with Mr. Carney for many years in English National Ballet. Furthering the “it’s a small world” theme, Dewi later left England and joined the National Ballet of Canada. He was also in the original Canadian cast of Andrew Lloyd Webber’s Phantom of the Opera, as well as Cats at Massey Hall, the UK National Tour of Chess and Resident Director of Pickwick with Sir Harry Secombe. Last stop – Toledo. 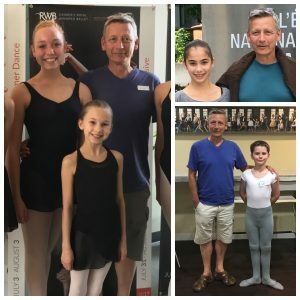 So many of Mr. Carney’s former dance colleagues, like him, are still sharing their love of ballet and theatre with the next generations around the world. We try to connect whenever possible. Last year, we caught up with Patrick Armand, Director of the San Francisco Ballet School and Summer Lee Rhatigan, Director of San Francisco Conservatory of Dance. The year before, we spent a wonderful day with the National Ballet of Canada while in rehearsal with Jackie Barrett, assistant to choreographer Christopher Wheeldon and associate director/choreographer of An American in Paris. 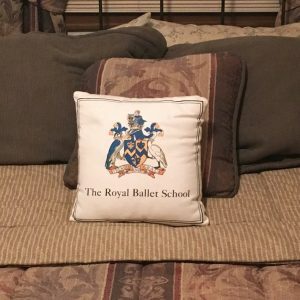 This year, we drove to Toledo, Ohio, to meet with Nigel Burgoine who danced for many years with Mr. Carney in English National Ballet, and who also trained full-time at the Royal Ballet School. 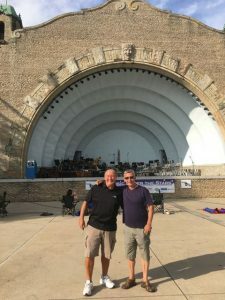 We were fortunate yet again to arrive in time for a most pleasant evening of music and dance, this time at the stunning Toledo Zoo Amphitheatre. Expanding further on our small-world theme, that production in Istanbul, in which one of Isabella’s NBS teachers had seen Mr. Carney dance, had also included Nigel Burgoine! And…one of his former Ballet Theatre of Toledo students, Spencer Hack, is now a dancer in the National Ballet of Canada following his training at Canada’s National Ballet School. Previous Post: Does my child need to wear performance makeup?